Showing items in category Saint Kitts-Nevis, sorted by newest listed first. ST.KITTS - 1952 12c postal stationery air letter mint struck SPECIMEN in black. H&G 1. 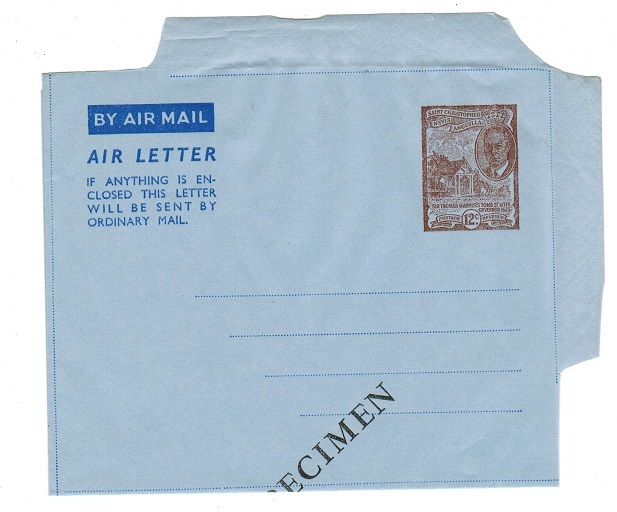 1952 12c brown and light blue postal stationery air letter in unused condition struck SPECIMEN diagonally in black. H&G 1. ST.KITTS - 1918 1d rate cover to USA with additional 1/2d 'War Tax' adhesive added. 1918 (JU.28.) cover addressed to USA bearing 'Leeward islands' 1d tied in combination with St.Kitts 1/2d green 'War Tax' stamp tied by ST.KITTS - A12 duplex. 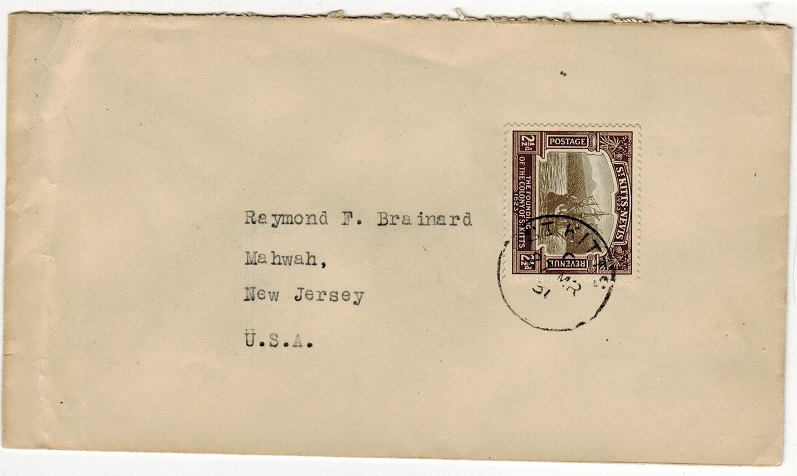 ST.KITTS - 1926 3d ultramarine RPSE of Leeward Islands uprated to USA. H&G 5a. 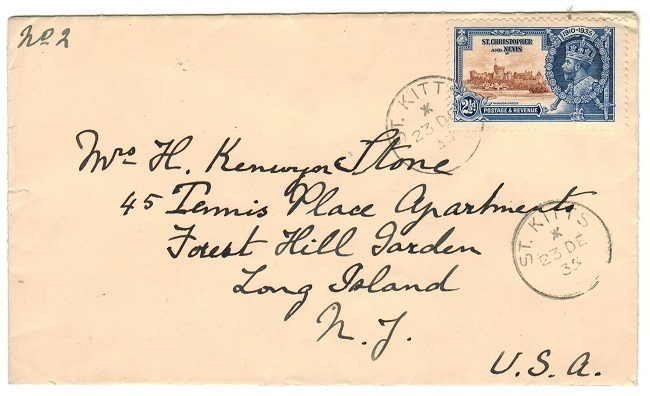 1926 3d ultramarine on cream registered postal stationery envelope (size G) of Leeward Islands addressed to USA and bearing Leeward island 1d and 1 1/2d 'key plate' adhesives tied by ST.KITTS cds dated SP.28.34. H&G 5a. 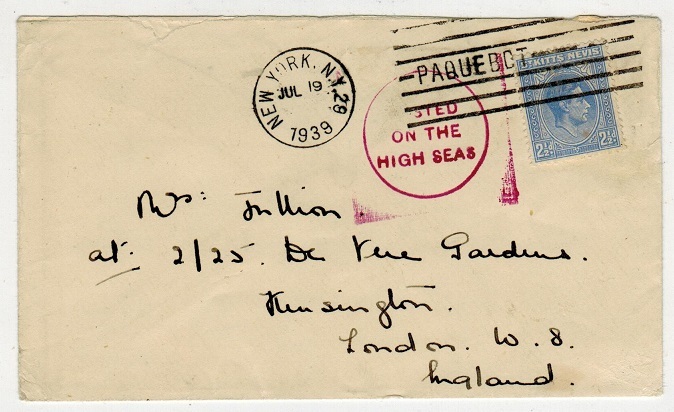 ST.KITTS - 1940 1 1/2d rate 'VIA IMPERIAL/BASSETERRE' cover to UK. 1940 (JA.15.) 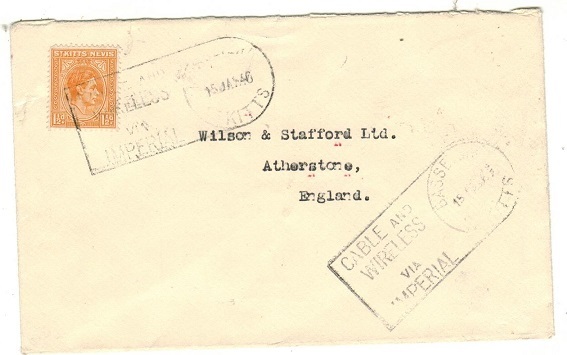 cover addressed to UK bearing 1 1/2d orange adhesive tied by scarce CABLE AND WIRELESS/VIA IMPERIAL cancel from BASSETERRE with a further example at lower left. 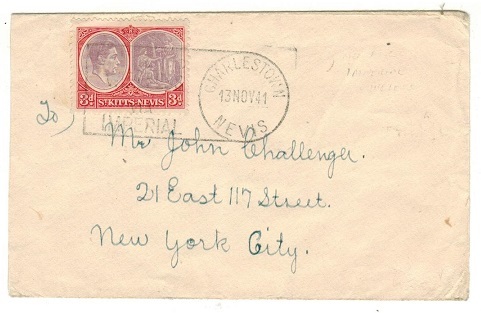 ST.KITTS - 1941 3d rate 'VIA IMPERIAL/CHARLESTOWN' cover to USA. 1941 (NOV.13.) 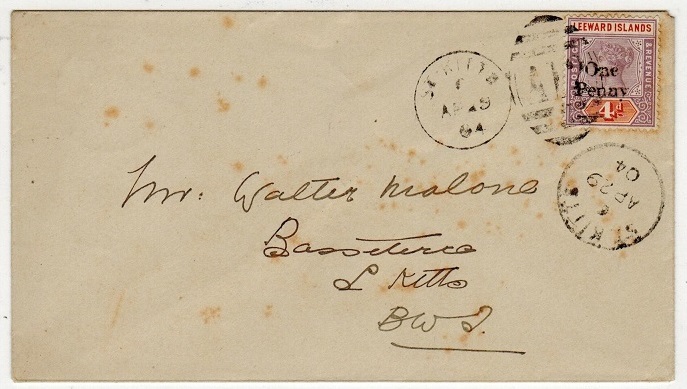 cover addressed to USA bearing 3d adhesive tied by VIA IMPERIAL/CHARLESTOWN NEVIS handstamp. ST.KITTS - 1927 10d rate registered cover to UK used at NEVIS. 1927 (SP.23.) registered cover addressed to UK bearing Leeward Island 4d and 6d 'key plate' adhesives tied by 'A09' duplex's with NEVIS cds alongside. A scarcer use at Nevis. ST.KITTS - 1918 1/2d 'War Stamp' use on registered cover to UK. 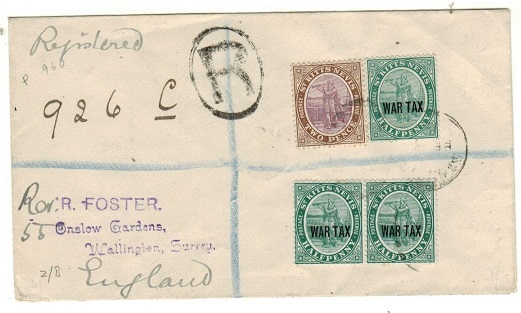 1918 registered cover addressed to UK bearing 1/2d green 'War Stamp' (x3) tied alongside 2d (SG 15) by light ST.KITTS cds. 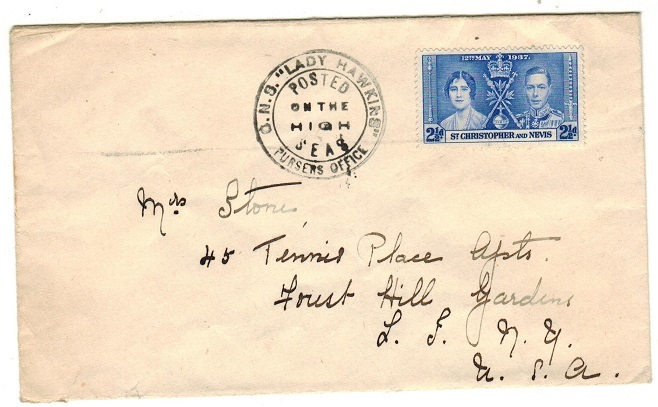 ST.KITTS - 1919 1/2d and 1 1/2d 'War Stamp' use on OHMS registered cover to UK. 1919 registered use of O.H.M.S. 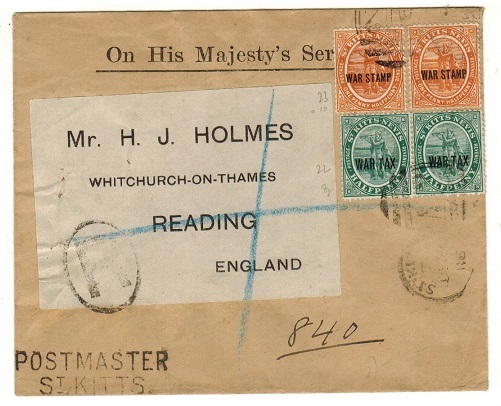 envelope addressed to UK handstamped POSTMASTER/ST.KITTS and bearing 1/2d and 1 1/2d 'War Stamp' adhesives (SG 22+23) tied ST.KITTS. ST.KITTS - 1919 1 1/2d 'War Stamp' use on OHMS registered cover to USA. 1919 (AP.11.) registered use of O.H.M.S. 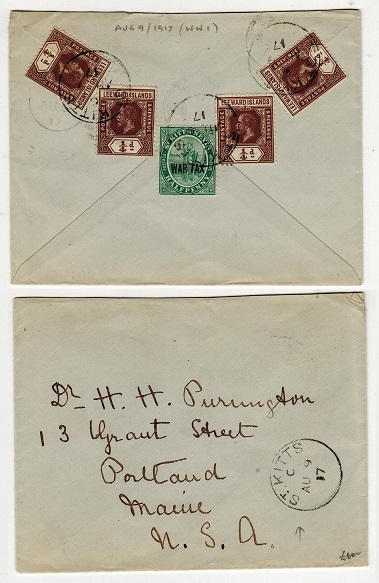 cover to USA (tear in bottom right corner and repaired) bearing three examples of the 1 1/2d 'War Stamp' (SG 23) tied ST.KITTS. ST.KITTS - 1980 55c 'HMS Winchester' adhesive U/M with OVERPRINT OMITTED variety. SG 45b. 1980 55c 'HMS Winchester' ship adhesive in fine unmounted mint condition showing the major variety OVERPRINT OMITTED. SG 45b. ST.KITTS - 1985 'Batik Designs' set in fine U/M IMPERFORATE PLATE PROOF pairs. SG 169-72. 1985 'Batik Designs' (2nd series) set of four in fine unmounted mint IMPERFORATE PLATE PROOF marginal pairs. SG 169-72. 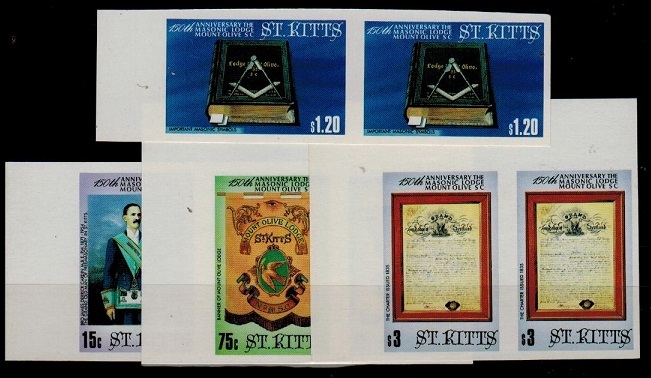 ST.KITTS - 1885 'Masonic Lodge' set in U/M maginal IMPERFORATE PLATE PROOF pairs. SG 177-80. 1885 'Masonic Lodge' set of four in fine unmounted mint maginal IMPERFORATE PLATE PROOF pairs. SG 177-80. ST.KITTS - 1935 2 1/2d rate combination cover to USA used at NEVIS. 1935 (MR.4.) cover addressed to USA bearing 1/2d and 1 1/d adhesives tied in combination with Leeward Island 1/2d 'key plate' by s/r NEVIS cds's. ST.KITTS - 1921 1/2d (x8) franked PAQUEBOT cover to USA. 1921 (JAN.2.) 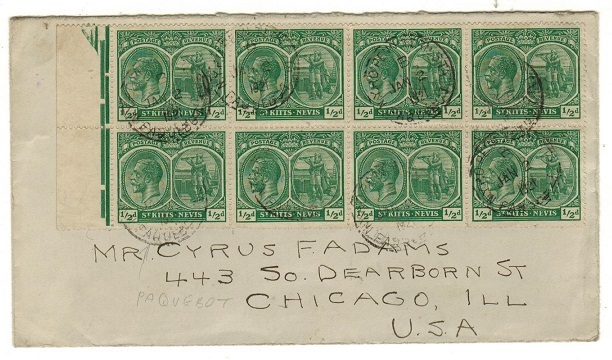 cover addressed to USA bearing 1/2d green block of eight (SG 24) tied by numerous strikes of the N.Y. PO. PENNTERM STA/PAQUEBOT maritime cancellator. 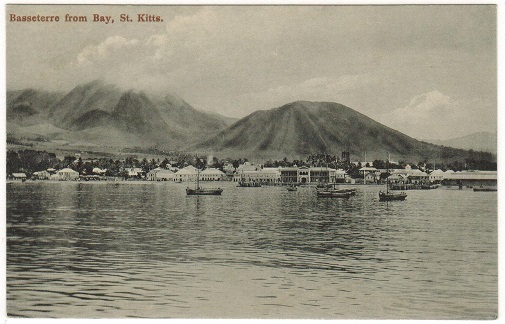 ST.KITTS - 1907 1/2d rate postcard to UK. 1907 (DE.12.) use of picture postcard addressed to UK depicting 'Monkey Hill-St.Kitts' bearing 1/2d adhesive tied by 'A 12' duplex with ST.KITTS cds alongside. ST.KITTS - 1937 (circa) 2 1/2d 'Coronation' cover to USA used on the LADY HAWKINS. 1937 (circa) cover addressed to USA bearing 2 1/2d 'Coronation' adhesive (uncancelled) with black C.N.S. LADY HAWKINS/POSTED ON THE HIGH SEAS/PURSERS OFFICE cancel at left. ST.KITTS - 1931 2 1/2d 'Tercentenary' stamp on cover to USA. 1931 (MR.27) cover to USA bearing the 2 1/2d (SG 52) 'Tercentenary' adhesive tied by ST.KITTS cds. The Tercentenary stamps are very rare used on cover with the 2 1/2d value being especially difficult to find. 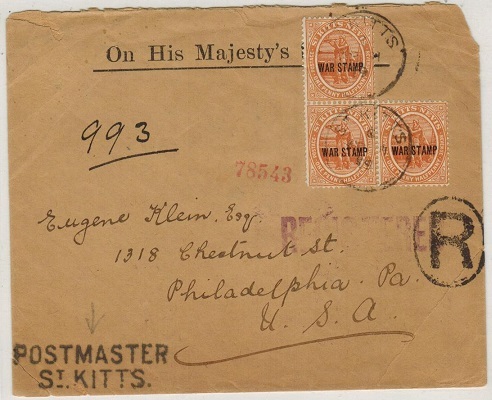 ST.KITTS - 1930 'POSTED ON THE HIGH SEAS' maritime cover with 1 1/2d 'War Stamp' use. 1930 (JAN.30.) 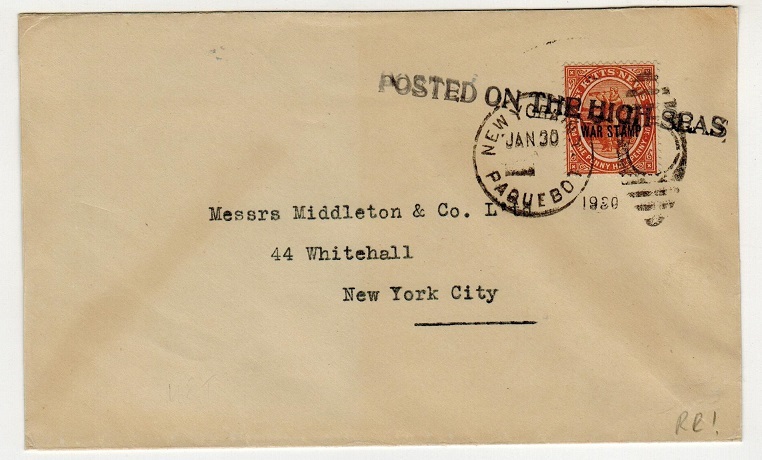 commercial cover addressed to USA bearing 1 1/2d orange 'War tax' adhesive tied by straight lined POSTED ON THE HIGH SEAS handstamp (late use of this stamp) with NEW YORK NY/ PAQUEBOT cancel alongside. 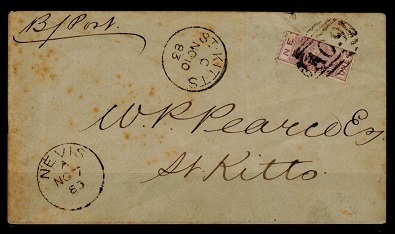 ST.KITTS - 1853 inward cover from UK rated '2/-'. 1853 (OC.15.) 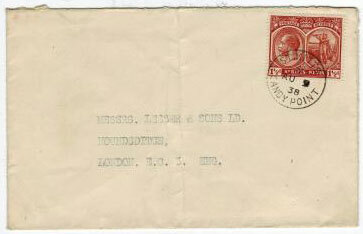 inward cover marked 'West Indies' rated '2/-' in manuscript cancelled by clover type cross CH/15 OC 85 cancel from Great Britain. Some tone staining but an early inward envelope. 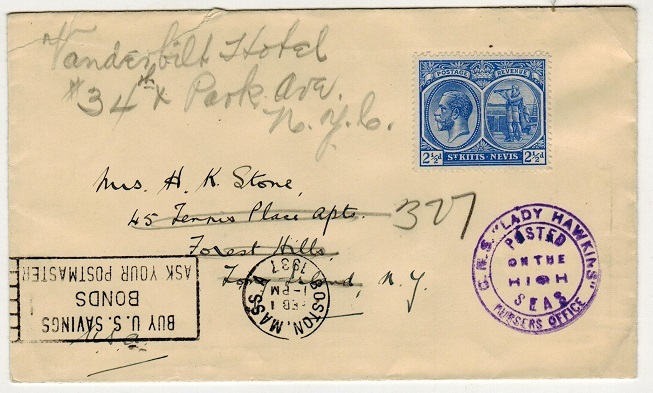 ST.KITTS - 1936 4 1/2d registered cover to USA used at NEVIS. 1936 (NO.5.) use of O.H.M.S. 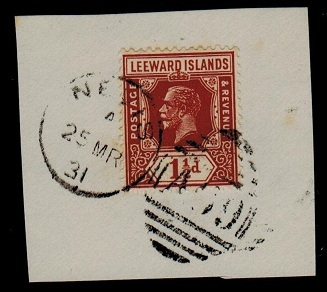 envelope addressed to USA (horizontal fold at bottom) bearing Leeward islands 'key plate' 1 1/2d (x3) adhesives cancelled by 'A 09' duplex's with NEVIS s/r cds at left. ST.KITTS - 1935 'Silver Jubilee' set mint with 1 1/2d showing RETOUCHED PANEL. SG 61-64. 1935 'Silver Jubilee' sert of four in fine mint condition with the 1 1/2d adhesive showing the RETOUCH PANEL variety below 'Postage & Revenue'. SG 61-64. ST.KITTS - 1943 1/- + 1 1/2d rate censor cover to USA with rare 'W' marking on manila censor strip. 1943 (NO.4.) 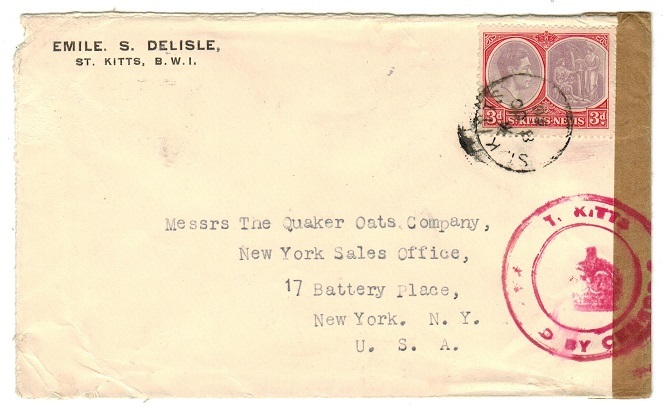 cover addressed to USA bearing 1 1/2d and 1/- adhesives tied by ST.KITTS cds. Struck left by red PAR AVION/VIA AIR MAIL h/s with 'local' brown manila strip at right tied on the front and reverse sides by unusual 'W' handstamp. Clear EXAMINED BY/14670 label applied on arrival in the US. The significance of this 'W' marking is unknown and is the first we have seen. Ex. C.Miller collection and was marked as very rare. ST.KITTS - 1941 3d rate 'FINANCIAL REGULATIONS' censor h/s censor cover to Canada. 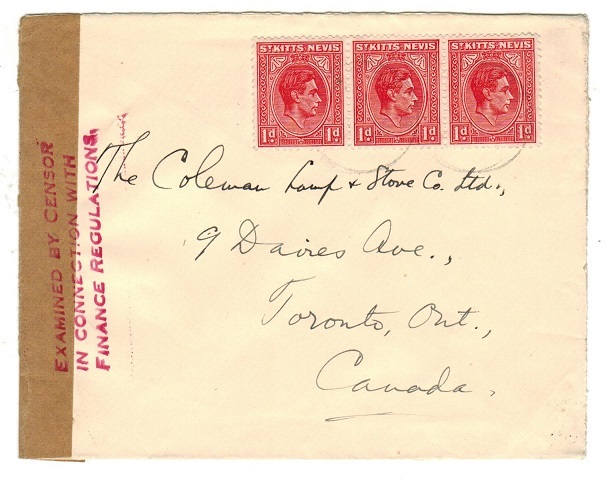 1941 (circa) cover addressed to Canada bearing 1d strip of three tied ST.KITTS with manila strip at left tied on the front by rare three lined EXAMINED BY CENSOR/IN CONNECTION WITH/FINANCE REGULATIONS censor mark in red ink. Miller type CFH1. ST.KITTS - 1941 3d rate rare 'FINANCIAL REGULATIONS/ST.KITTS' censor cover to USA. 1941 (AU.23.) 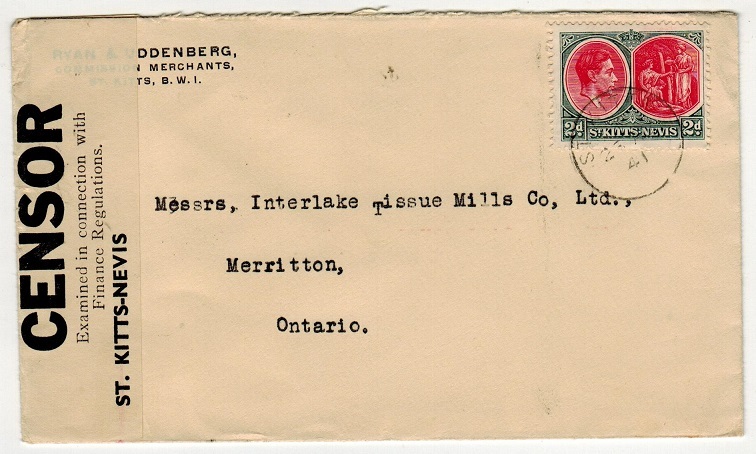 cover addressed to Canada bearing 2d adhesive tied by ST.KITTS cds and with black on white OPENED BY/CENSOR/EXAMINED IN CONNECTION WITH/FINANCE REGULATIONS/ST.KITTS-NEVIS censor label at left edge. (Miller type CFL1). A very rare censor label only know used during a short 8 month period in 1941. ST.KITTS - 1941 3d rate 'PASSED BY CEN' cover to USA showing the rare missing 'SOR'. 1941 (AU.2.) 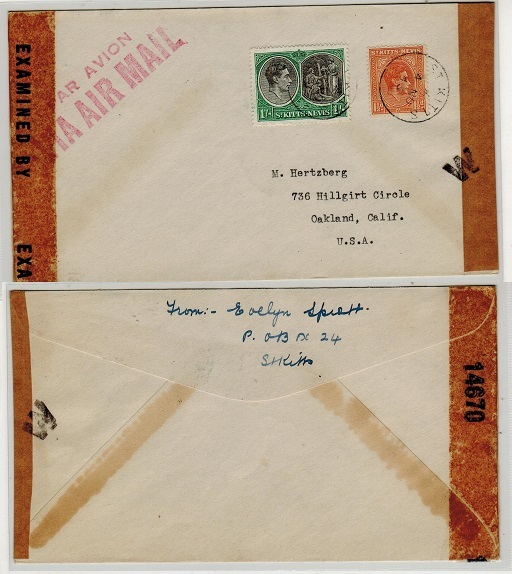 cover addressed to USA bearing 3d adhesive tied by ST.KITTS cds and struck at left by circular crowned ST.KITTS/PASSED BY CEN censor handstamp in black ink. Miller records only one known use of this (CH2c) strike with missing 'SOR' but that being struck in red ink. A rare item indeed. ST.KITTS - 1940 3d rate 'PASSED BY -- 3' (missing censor) cover to USA. 1940 (DE.23.) 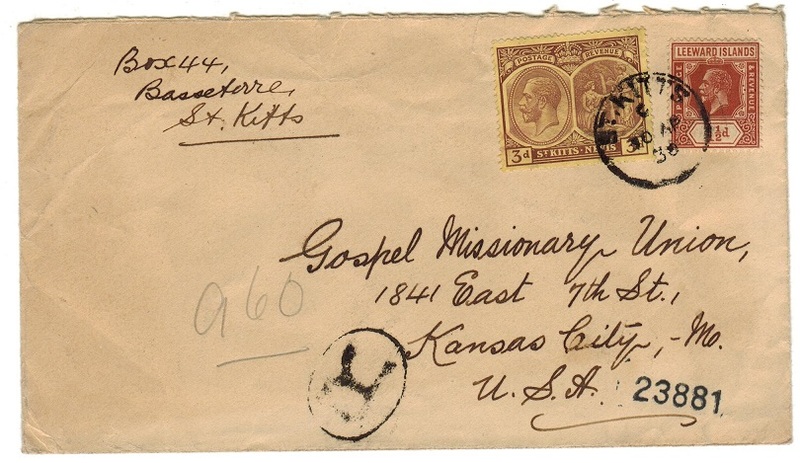 cover addressed to USA bearing 3d adhesive tied ST.KITTS and with red circular crowned ST.KITTS/PASSED BY CENSOR 3 h/s applied but 'censor' being omitted. This most likely being a progressive variety of Miller CHC2c showing just the 'SOR' of censor being omitted. ST.KITTS - 1939 early 'PASSED THE CENSOR' cover to USA. 1939 (SP.13.) 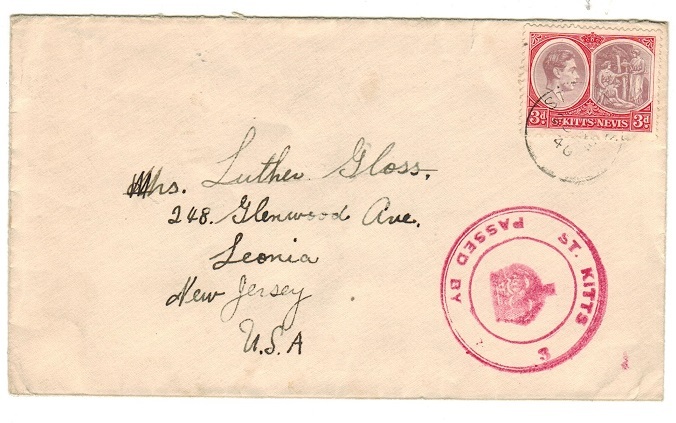 commercial cover addressed to USA bearing 2 1/2d adhesive tied ST.KITTS and struck by red PASSED THE CENSOR s/l handstamp at left. Miller type CH1. A nice early censor cover. ST.KITTS (Nevis) - 1906 2 1/2d rate cover to USA used at NEVIS. 1906 (AU.18.) 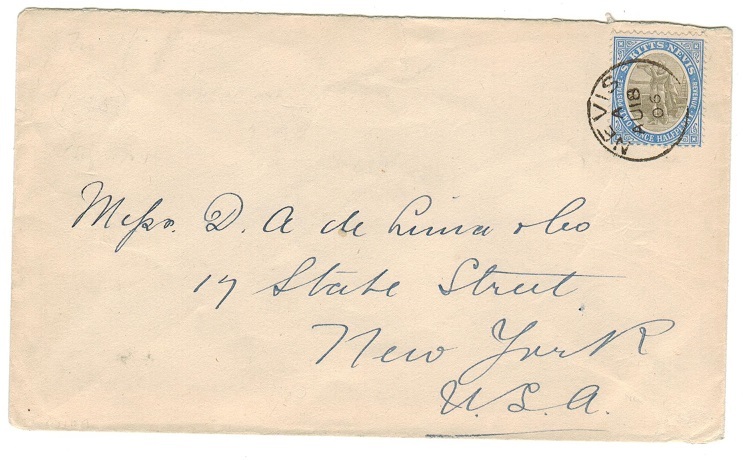 cover addressed to USA bearing St.Kitts 2 1/2d adhesive tied by very fine s/r NEVIS cds with 'A' code. ST.KITTS (Nevis) - 1902 1d trio 'surcharge' cover to Charlestown. 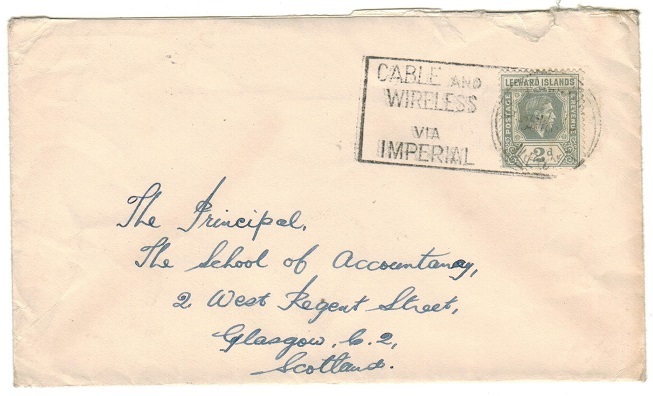 1902 cover addressed locally to Charlestown bearing the three 1d surcharge adhesives (SG17-19) each neatly cancelled by scarce 'A 09' duplex's of Nevis. A scarce philatelic use. ST.KITTS - 1930 'MAILED AT SEA' cover to the Archdeacon of St.Kitts. 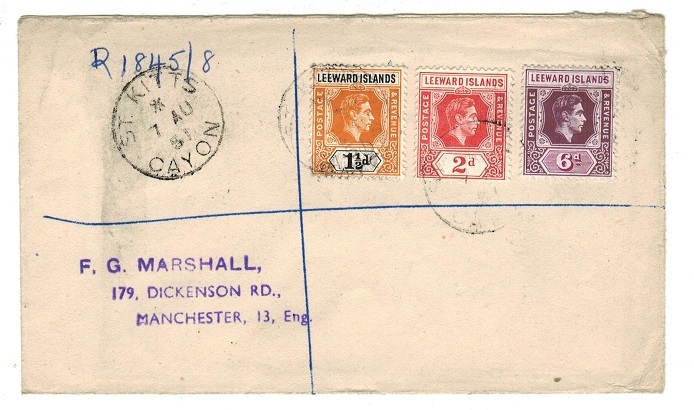 1930 cover addressed to the 'Archdeacon Of St-Kitts' bearing Leeward Island 1d 'key plate' (uncancelled and damaged) with blue MAILED AT SEA handstamp applied at left and with ST.KITTS arrival cds at lower left dated 23.JY.30. 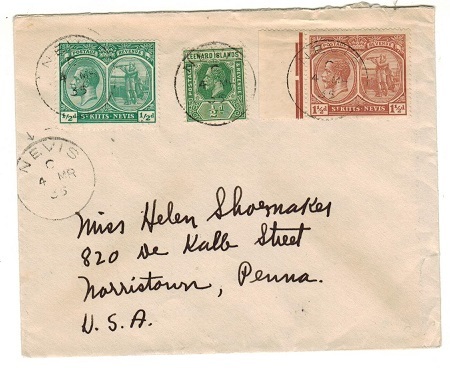 ST.KITTS - 1937 'C.N.S.LADY HAWKINS' maritime cover to USA. 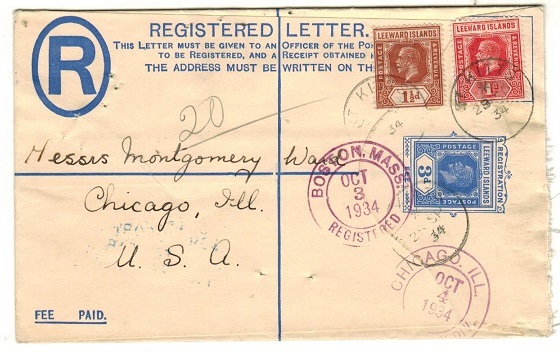 1937 cover addressed to USA bearing 2 1/2d adhesive (un-cancelled) but with violet circular C.N.S. LADY HAWKINS/POSTED ON THE HIGH SEAS cachet applied below. BOSTON/BUY US SAVINGS BONDS arrival strike on front dated FEB.1.37. ST.KITTS - 1935 2 1/2d rate cover to USA. 1935 (FE.27.) 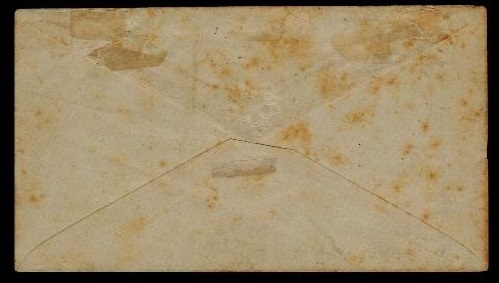 cover addressed to USA bearing 2 1/2d adhesive (SG 44) tied by ST.KITTS cds. ST.KITTS - 1935 2 1/2d 'Silver Jubilee' franked cover to USA. 1935 (DE.23.) 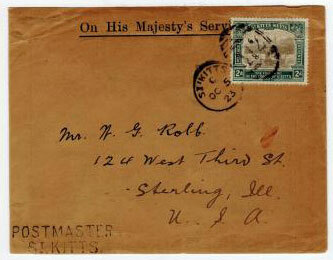 cover addressed to USA (roughly opened at bottom) bearing 2 1/2d 'Silver Jubilee' adhesive (SG 63) tied by ST.KITTS cds. ST.KITTS - 1945 1/4d rate registered 'BB/202' censor cover to USA. 1945 (FE.4.) 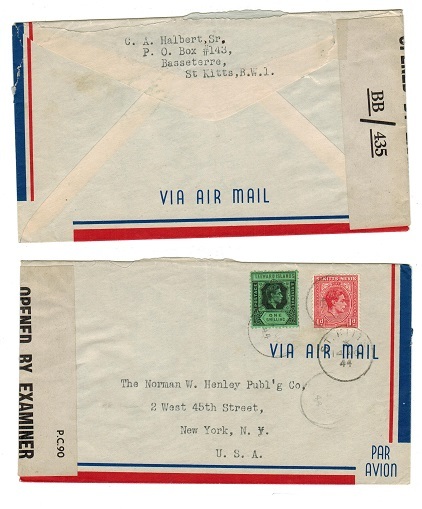 commercial registered cover to USA bearing 2d (x2) and 1/- adhesive tied ST.KITTS with black on white P.C.90/OPENED BY EXAMINER/ BB/202 censor label at left. Miller type CL4. ST.KITTS - 1942 3d rate 'PASSED BY CENSOR/3' cover to USA struck in 'violet'. Scarce in this colour. 1942 (MR.5.) 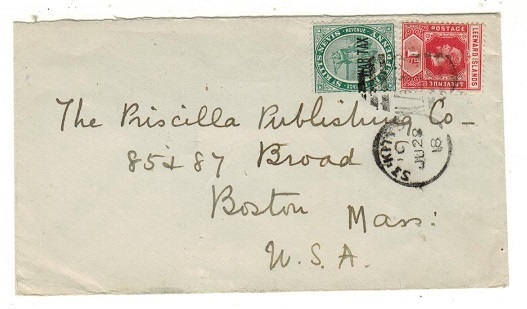 cover addressed to USA bearing a fine block of six of the 1/2d green adhesive tied by ST.KITTS cds tied at left with manilla censor strip and struck on the front by a very fine strike of the crowned ST.KITTS/PASSED BY CENSOR 3 h/s struck in 'violet' ink. Miller type CH2a. ST.KITTS - 1941 3d rate 'PASSED BY CENSOR/4' cover to USA. 1941 (AP.26.) 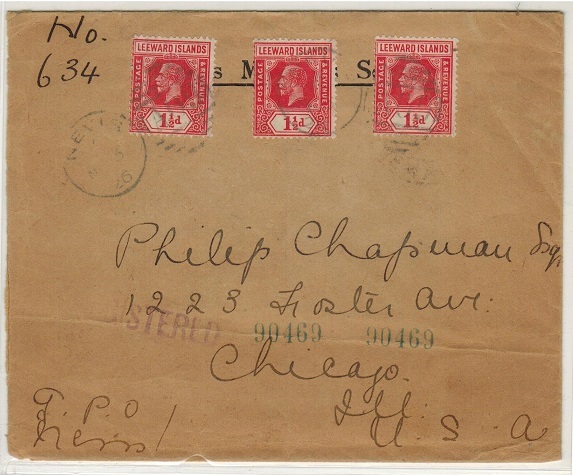 cover addressed to USA bearing 3d adhesive tied by central ST.KITTS cds with manila censor strip at right struck on the front by a light strike of the crowned ST.KITTS/PASSED BY CENSOR 4 h/s in red. Little type CH2a. ST.KITTS - 1939 2 1/2d rate 'PASSED BY CENSOR/2' cover to USA. ST.KITTS - 1934 2 1/2d rate cover to USA. 1934 (JU.22.) 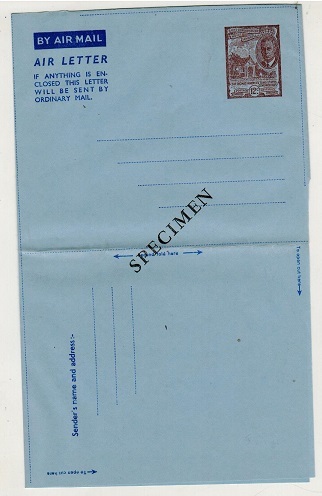 cover addressed to USA bearing 2 1/2d pale bright blue (SG 42) tied by ST.KITTS cds. 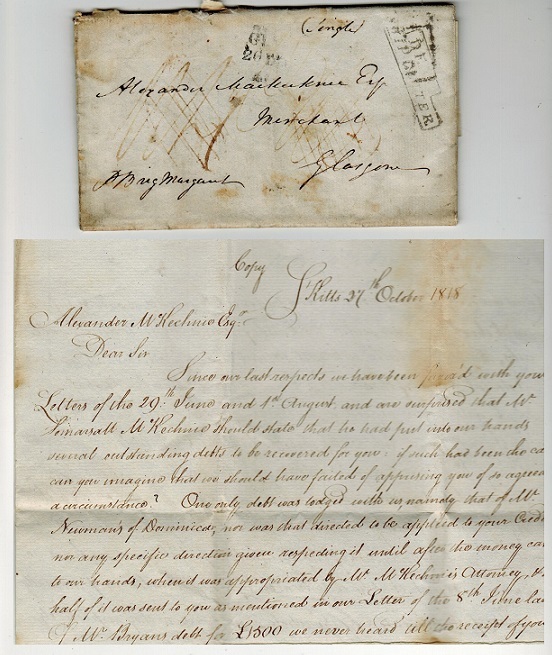 ST.KITTS - 1818 entire to UK with stepped DEAL/SHIP LETTER h/s applied. 1818 (OCT.27.) 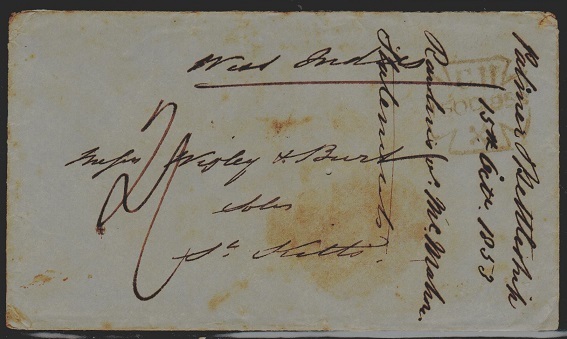 entire addressed to UK marked 'single' in manuscript and with stepped DEAL/ SHIP LETTER strike applied on front. Part GLASGOW double lined receipt mark dated 20.DE.18. A scarce early letter. ST.KITTS - 1904 1d rate postcard use to UK. 1904 (FE.22.) use of picture postcard addressed to UK depicting 'Basseterre from the sea' and bearing Leeward 1d adhesive tied to picture side by "A 12" duplex with ST.KITTS cds alongside. Attractive item. ST.KITTS - 1952 £1 'key plate' (SG 114c) on local cover. 1952 (MR.17.) 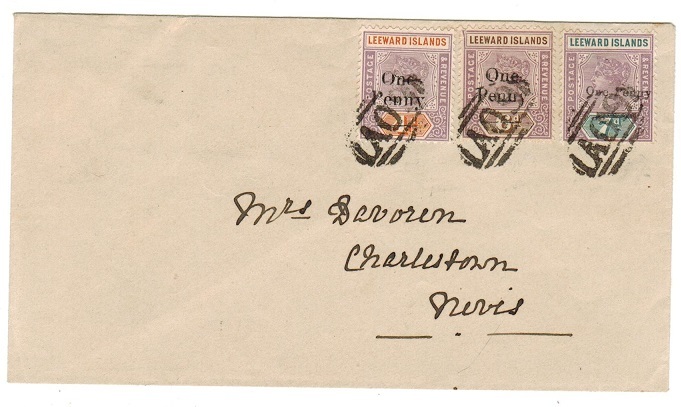 registered cover addressed to USA bearing Leeward Islands £1 'key plate' adhesive (SG 114c) tied ST.KITTS. A scarce high value on cover. ST.KITTS - 1952 £1 'key plate' (SG 114a) on local cover. 1952 (JA.3.) cover addressed locally bearing Leeward Islands £1 purple and black on red (SG 114a) cancelled by ST.KITTS cds with a further strike below. A touch of tone spots in a centre line. A scarce stamp on cover. ST.KITTS - 1940 2d rate cover to UK cancelled by CABLE AND WIRELESS/CHARLESTON cancel. 1940 (MY.3) cover to UK bearing Leeward 'KGVI' keyplate 2d adhesive tied by scarce CHARLESTOWN/CABLE AND/WIRELESS/VIA IMPERIAL h/s. 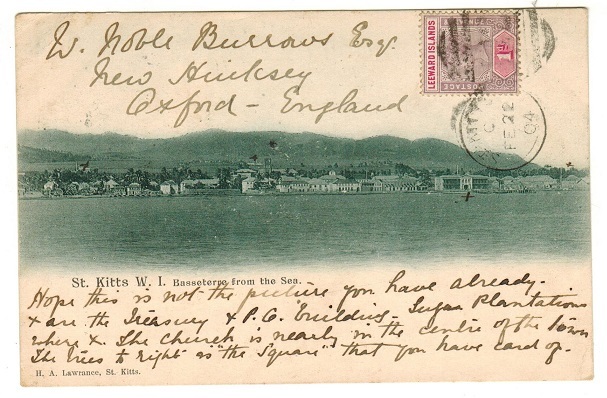 ST.KITTS - 1904 local cover bearing Leeward Islands 1d on 4d surcharge (SG 17) used at ST.KITTS. 1904 (AP.29.) cover addressed locally to Basseterre (some light tone spots) bearing Leeward Islands 1d on 4d surcharge adhesive (SG 17) tied by 'A 12' duplex with ST.KITTS cds alongside. ST.KITTS - 1904 2 1/2d ultramarine PSE to Austria used at ST.KITTS. H&G 2. 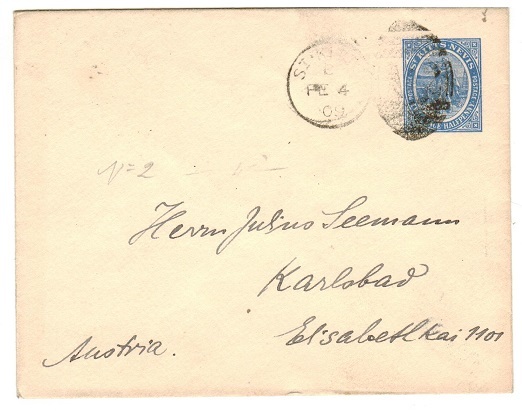 1904 2 1/2d ultramarine on cream postal stationery envelope addressed to Austria cancelled by 'A 12' duplex with ST.KITTS cds alongside dated FE.4.09. H&G 2. 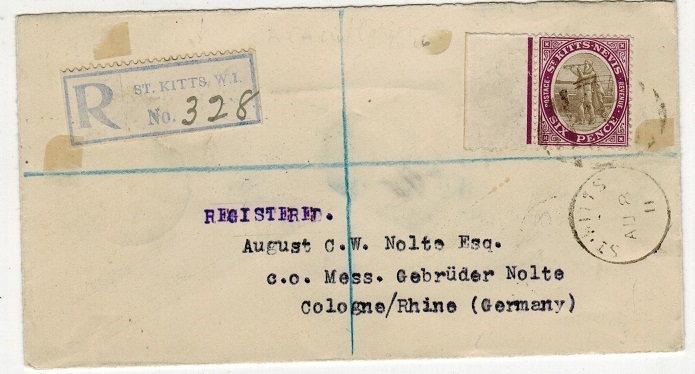 ST.KITTS - 1911 6d rate registered cover to Germany. 1911 (AU.8.) 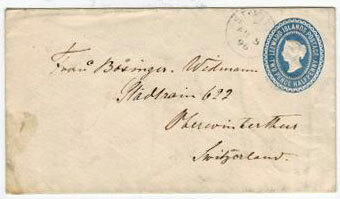 registered cover addressed to Germany (ex reverse flap) bearing 6d adhesive tied by 'A 12' duplex with ST.KITTS cds below and blue on white perforated R/ST.KITTS. W.I. Registered label at left. ST.KITTS - 1940 3d rate censored cover to USA. 1940 (OC.8.) 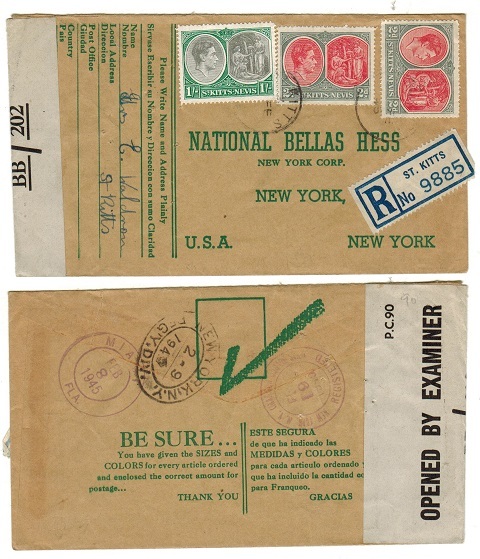 commercial cover addressed to USA bearing 3d adhesive tied ST.KITTS and with manilla censor tape at right edge tied on the front by red crowned circular ST.KITTS/PASSED BY CENSOR 3 h/s. Miller type Ch2a. 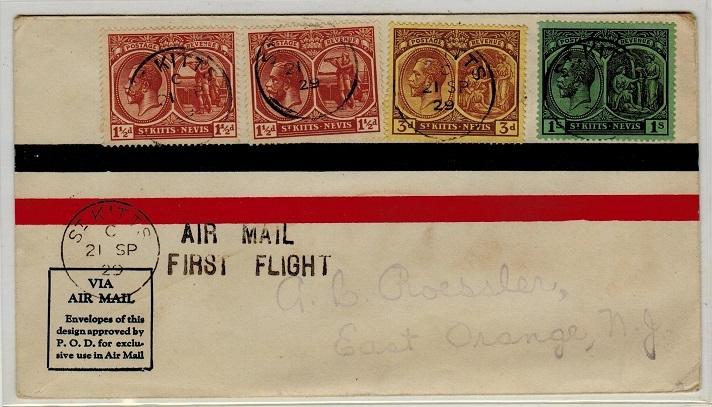 ST.KITTS - 1929 first flight cover to USA. 1929 (SP.21.) 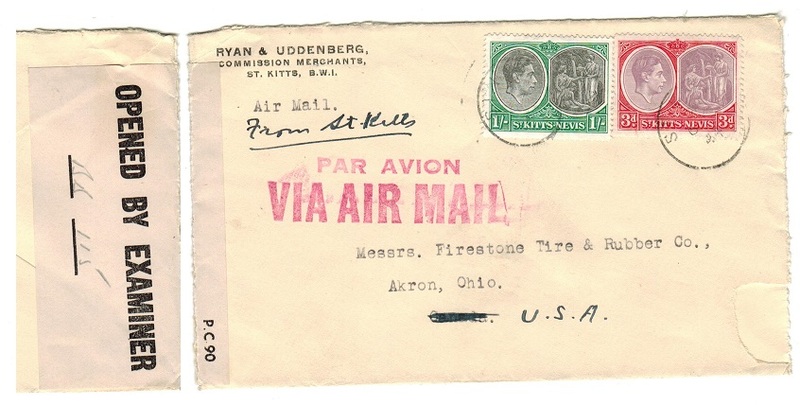 cover addressed to USA bearing 1 1/2d (x2), 3d and 1/- adhesives tied by ST.KITTS cds and struck below by rare two lined AIR MAIL/FIRST FLIGHT handstamp in black. ST.JOHNS/ ANTIGUA transit b/s. ST.KITTS - 1944 censor cover to USA. 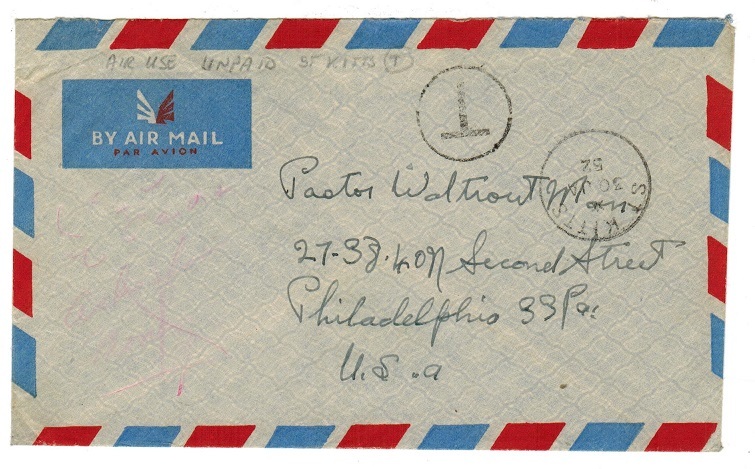 1944 commmercial cover addressed to USA (small piece of edge missing/opened on 3 sides) bearing 3d and 1/- adhesives tied ST.KITTS with black on cream P.C.90/OPENED BY EXAMINER censor label at left edge with 'BB 115' inserted in manuscript. Miller type CL3 but unrecorded with the '115' numerals. ST.KITTS - 1917 cover to USA with Leeward Island 1/4d (x4) used with 1/2d WAR TAX issue. 1917 (AU.9.) cover addressed to USA bearing Leeward Islands 1/4d brown 'key plate' adhesive (x4) tied in combination with 1/2d green 'WAR TAX' adhesive (SG 22) by ST.KITTS cds. A scarce combination. ST.KITTS - 1930 registered 4 1/2d rate combination cover to USA. 1930 (AP.30.) registered cover addressed to USA originating from Basseterre bearing Leeward 1 1/2d adhesive in combination with St.Kitts 3d tied ST.KITTS. ST.KITTS - 1942 censor cover to Canada. 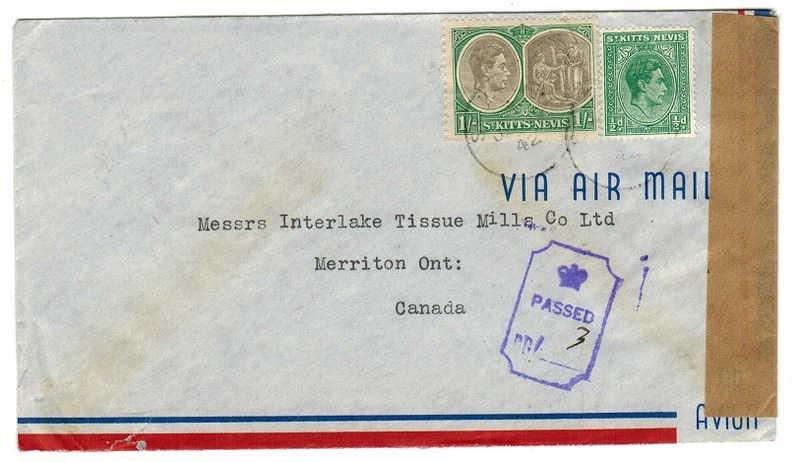 1942 cover addressed to Canada bearing 1/2d and 1/- adhesives tied ST.KITTS with manila censor label at right and struck on the front by violet crowned PASSED/BB/….. censor strike with '3' inserted in manuscript. Miller type CH4. ST.KITTS - 1945 inward censor cover from Curacao with BB/198 label applied. 1945 inward cover from Curacao with light red CENSUUR/CUACAO h/sd applied on front. ST.KITTS arrival b/s dated 4.MY.45 with black on greyish P.C.90/OPENED BY EXAMINER/ BB/198 censor label applied at left. (Miller type CL4). ST.KITTS - 1951 registered cover to UK used at CAYON. 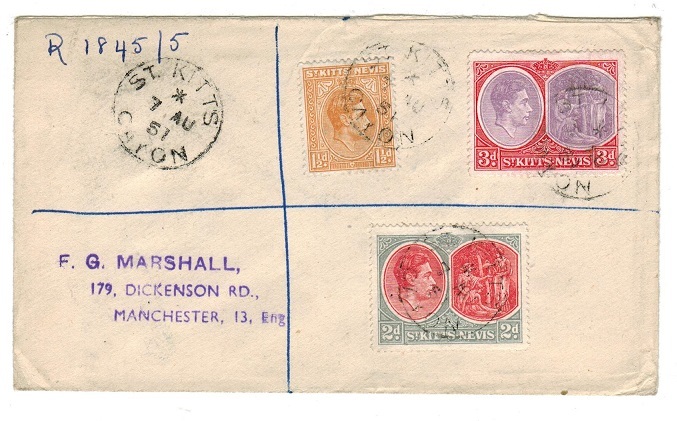 1951 (AU.7) registered cover to UK bearing 1d pair (SG 69c) & a strip of three of the 3c College adhesive (SG 92) tied by various ST.KITTS/CAYON cds's. ST.KITTS - 1952 12c postal stationery air letter overprinted SPECIMEN. 1952 12c red-brown on blue postal stationerty air letter in fine unused condition with black diagonal SPECIMEN overprint applied to front. Very scarce. 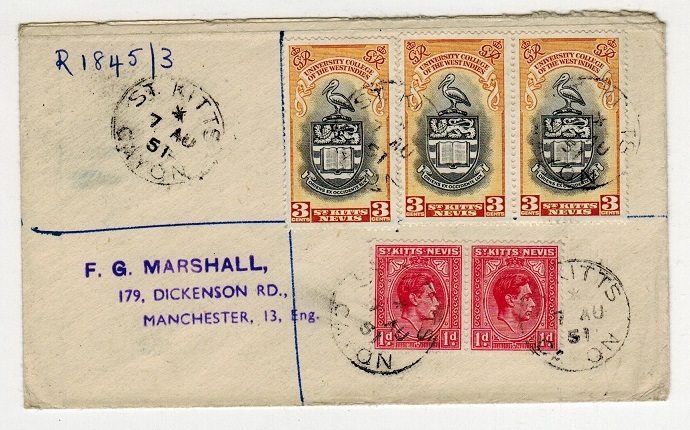 ST.KITTS - 1939 2 1/2d rate maritime cover to UK. 1939 (Ju.19) cover to UK bearing 2 1/2d (SG 72) tied by barred PAQUEBOT cancel with red circular POSTED/ON THE/HIGH SEAS strike alongside. ST.KITTS - 1945 inward censor cover with OBE 'BB/202' label. 1945 inward cover from Dutch Curacao with ST.KITTS arrival b/s dated 27.AP.45 with black on greyish P.C.90/OPENED BY EXAMINER/ BB/202 censor label at left. Miller type CL4. A scarce inward censored cover. ST.KITTS - 1944 censor cover to USA with OBE 'BB/435' label. 1944 (NO.14.) 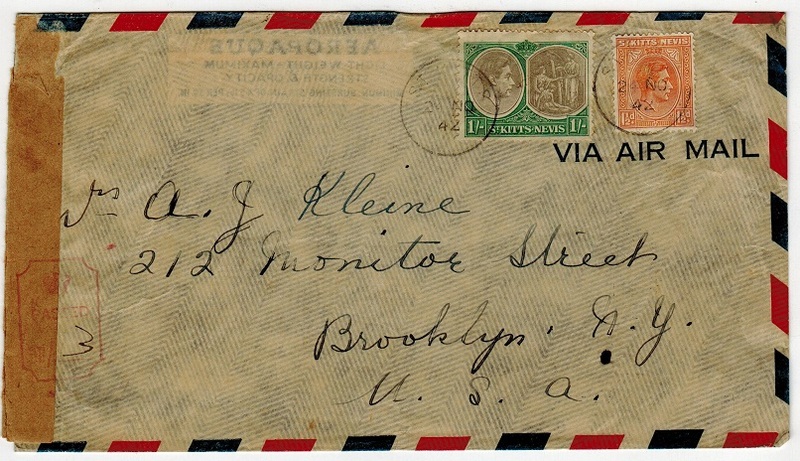 cover addressed to USA bearing 1d and 1/- adhesives tied ST.KITTS with black on greyish white P.C.90/OPENED BY EXAMINER/ BB/435 censor label at left. (Little type CL4). ST.KITTS - 1942 censor cover to USA. 1942 (NO.2.) 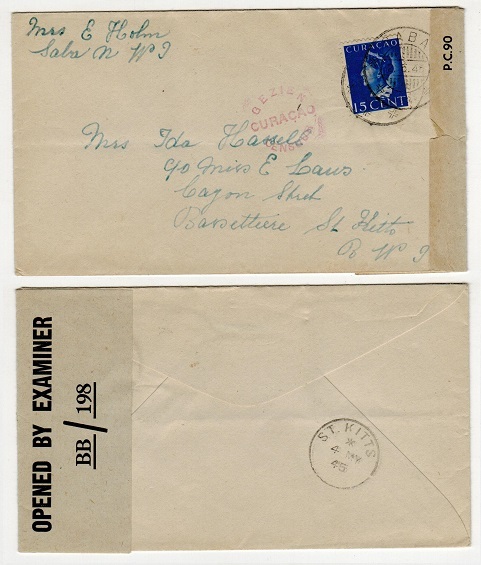 cover addressed to USA bearing 1 1/2d and 1/- adhesives tied ST.KITTS with manilla censor strip at left tied on the front by curved edged boxed 'crown' PASSED/ DB/…. censor strike in red ink with '3' inserted in manuscript. ST.JOHNS/ANTIGUA transit b/s. ST.KITTS - 1950 'Anguilla Tercentenary' issues on cover to UK used at CHARLESTOWN/NEVIS. 1950 (NO.11.) 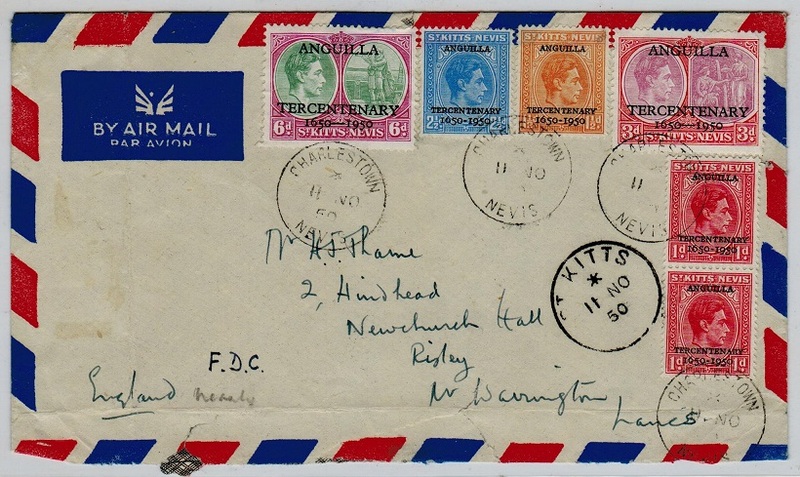 cover addressed to UK (tatty edges and crease at left) marked 'FDC' and bearing 1d pair, 1 1/2d, 2 1/2d, 3d and 6d adhesives overprinted ANGUILLA/TERCENTENARY and cancelled by s/r CHARLESTOWN/NEVIS cds's with ST.KITTS transit cds below. ST.KITTS - 1935 6d rate cover to UK used at SANDY POINT. 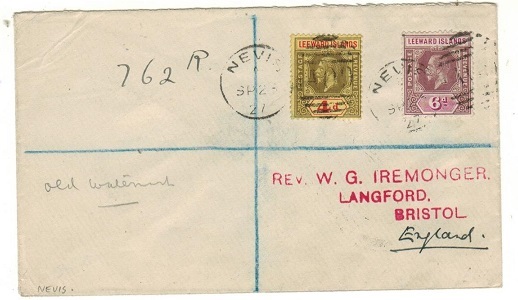 1935 (MR.15) cover to UK bearing Leeward Island 6d adhesive (SG72) tied by s/r ST.KITTS/ SANDY POINT cds. ST.KITTS - 1908 multi franked postcard to Germany used at ST.KIITS. 1908 (FE.14.) 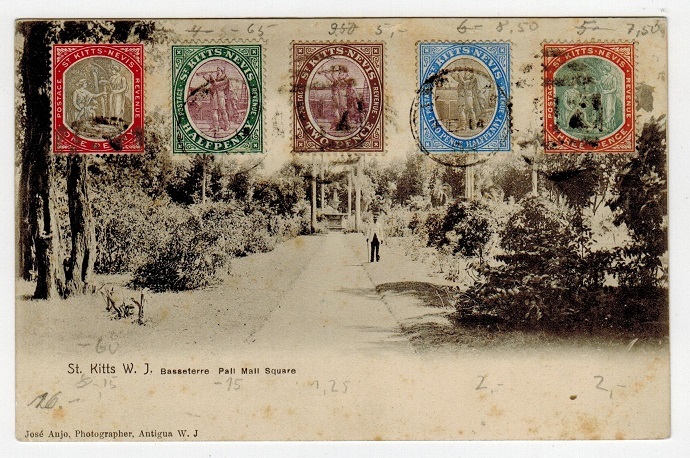 use of picture postcard addressed in pencil to Germany and depicting 'St.Kitts- Basseterre Pall Mall Square' and bearing 1/2d, 1d, 2d, 2 1/2d and 3d adhesives all tied to the top of the picture side by ST.KITTS and 'A 12' duplex cancels. 1951 (AU.7) registered cover to UK bearing `KGVI' 1 1/2d, 2d & 3d adhesives tied by various ST.KITTS/CAYON cds's. ST.KITTS - 1951 registered cover to UK with Leeward key plates used at CAYON. 1951 (AU.7) registered cover to UK bearing Leeward Islands 'key plate' 1 1/2d, 2d & 3d adhesives tied by ST.KITTS/CAYON cds's. ST.KITTS - 1952 stampless cover to USA with 'T' h/s applied. 1952 (Ja.30) stampless cover addressed to USA cancelled by ST.KITTS cds with fine circled 'T' tax marking alongside. Scarce. ST.KITTS - 1951 local philatelic BI-SECT cover. 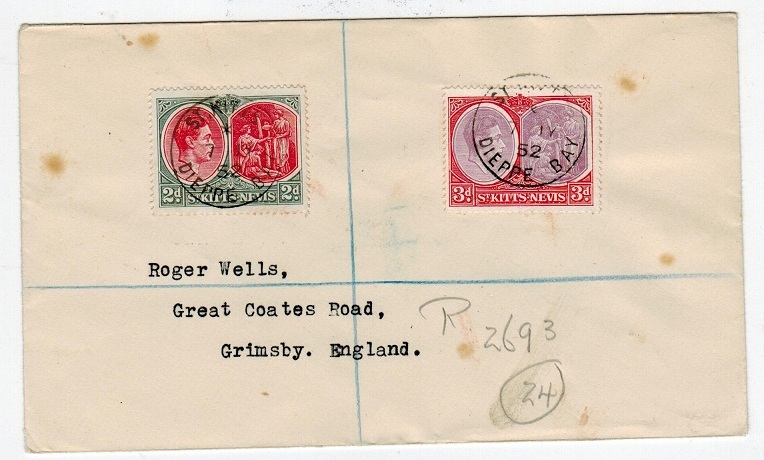 1951 (FE.18) philatelic cover addressed locally bearing the 1950 'Anguilla Tercentenary' 1d rose-red adhesive (SG 86) in a pair with one stamp showing the major variety STAMP DIAGONALLY BI-SECTED and cancelled by BASSETERRE/ST.KITTS cds. The year '51' appears to have been doubled. A most unusual 'KGVI' item. 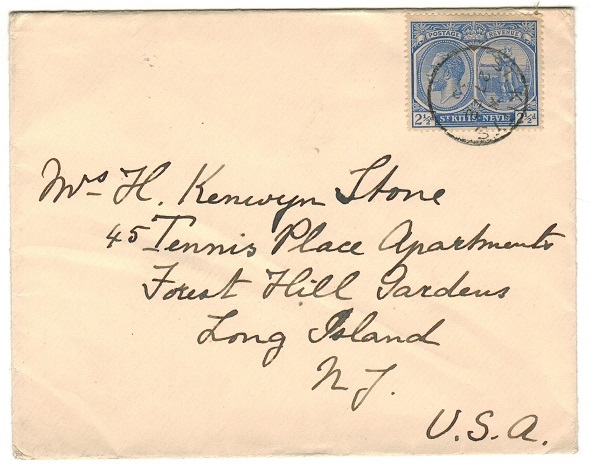 ST.KITTS - 1945 stampless cover addressed to USA with scarce OFFICIAL PAID/ST.KITTS cds. 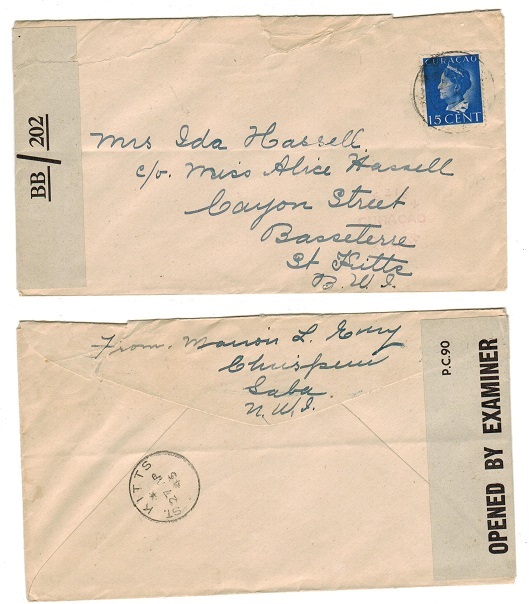 1945 use of stampless manilla envelope (225x100mm) addressed to USA cancelled by scarce OFFICIAL PAID/ST.KITTS cds dated 29.SP.45 with small red boxed POST-MASTER/ST. KITTS h/s at lower left. ST.KITTS - 1903 2d RPSE (size H2) uprated to Canada. H&G 1c. 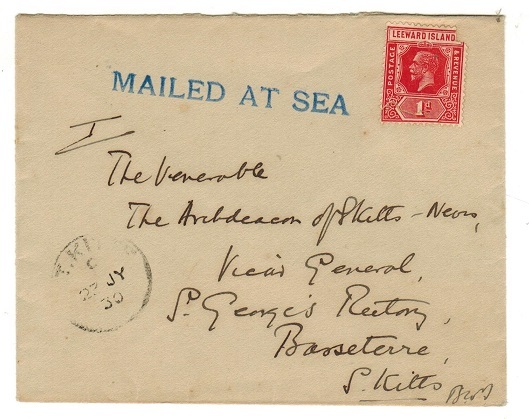 1903 2d ultramarine on cream registered postal stationery envelope (size H2) addressed to Canada (central fold) bearing additional Leeward island 'key plate' 1/2d and 4d adhesives tied by ST.KITTS cds's dated 5.DE.25. The cover oeriginating at Basseterre. H&G 1c. ST.KITTS - 1920 (circa) unused postcard of The Waterfall at Green Hill. 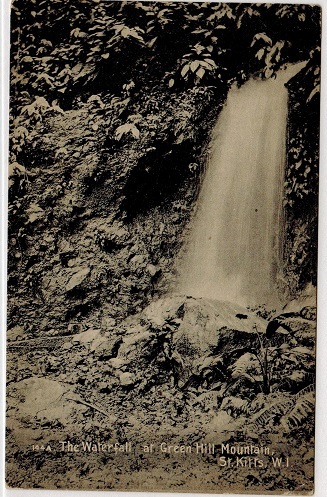 1920 (circa) picture postcard in fine unused condition depicting 'The Waterfall At Green Hill Mountain, St.Kitts'. (Un-divided 'green' back-A.M.Losada-No.105a). 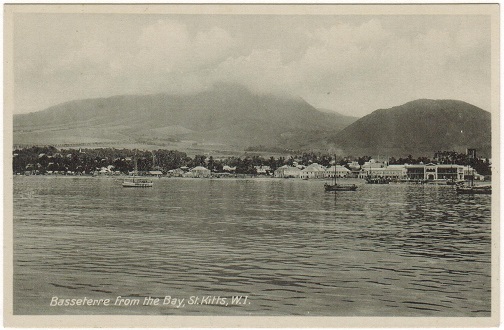 ST.KITTS - 1920 (circa) unused postcard of Basseterre Bay. 1920 (circa) picture postcard in fine unused condition depicting 'Basseterre from the Bay-St.Kitts'. (Divided back-A.M.Losada No.74a). 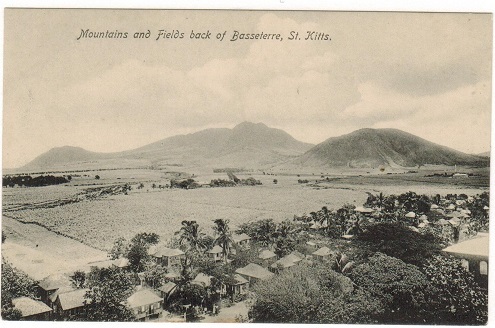 ST.KITTS - 1920 (circa) unused postcard of Mountains at Basseterre. 1920 (circa) picture postcard in fine unused condition depicting 'Mountains and field back of Basseterre, St.Kitts'. (Divided back-A.M.Losada No.104a). ST.KITTS - 1920 (circa) unused postcard of Basseterre. 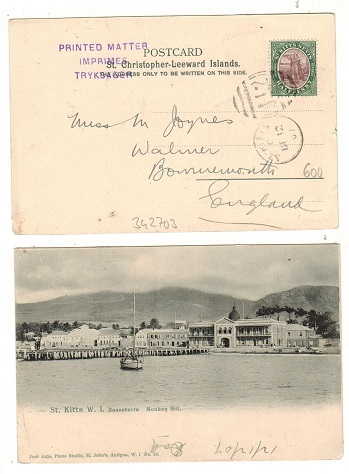 1920 (circa) picture postcard in fine unused condition depicting 'Basseterre from Bay, St.Kitts'. in the distance, St.Kitts'. (Divided back-A.M.Losada No.52a). ST.KITTS (Nevis) - 1883 1d violet BI-SECT on cover. SG 26a. 1883 (NO.7.) 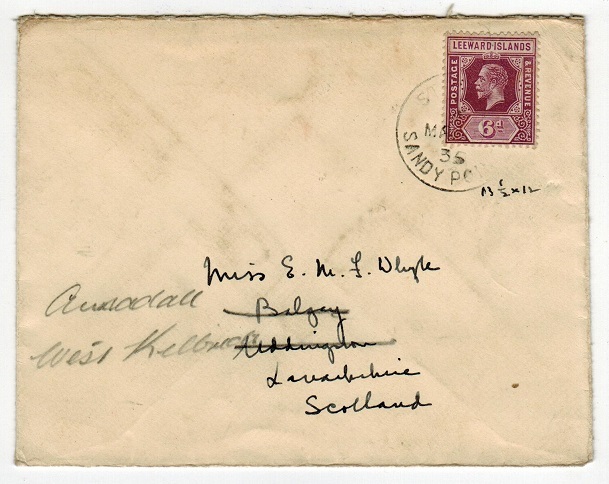 cover addressed to St.Kitts bearing the 1d violet BI-SECTED VERTICALLY to make the 1/2d rate tied by 'AO 9' duplex with NEVIS cds below. The cover has some tone spotting on front and reverse but is marked 'Book Post' in manuscript and has ST.KITTS arrival cds dated NO.10.83. SG 26a. 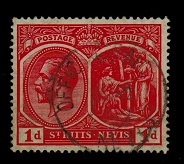 ST.KITTS (Nevis) - 1877 1d red REVENUE. NEVIS - 1877 1d red (SG type 1) in fine mint condition overprinted REVENUE in black. Barefoot and Hall 5. ST.KITTS - 1890 un-issued ESSAY. 1890 un-denominated & un-issued ESSAY of the head & frame showing 'St.Kitts' at top & 'Postage' at bottom finely engraved in black on thin cream card. The design being similar to the first St.Lucian issues. Previously thought to have been the work of Samuel Allen Taylor (of the Boston forgers fame) but is actually a Perkins Bacon proof used for publicity purposes. It is thought only 20-30 were issued in three various colours. (Green, black and brown). ST.KITTS - 1921 1d (SG 38) cancelled OFFICIAL PAID/NEVIS. 1921-29 1d Rose carmine (SG 38) cancelled by neat central OFFICIAL PAID/NEVIS cds dated JY.27.22. A scarce strike. 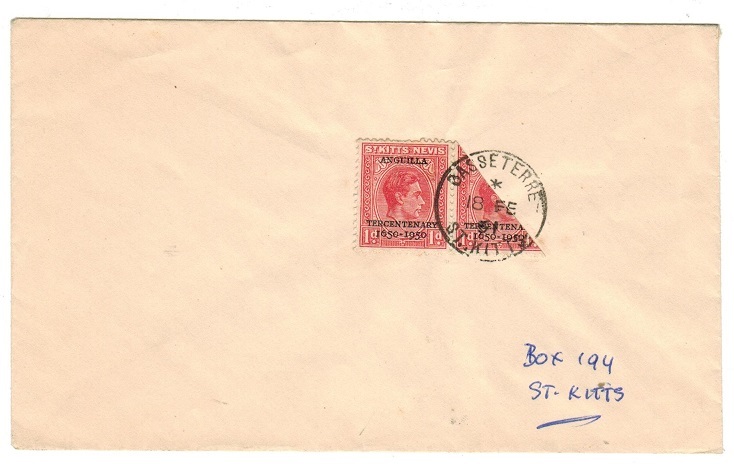 ST.KITTS - 1952 registered cover used at DIEPPE BAY. 1952 (JY.7) registered cover to UK bearing KGVI 2d+3d tied ST.KITTS/DIEPPE BAY cds's. (Few odd tone spots on cover). ST.KITTS (Nevis) - 1929 1 1/2d (SG 64) used at NEVIS. 1929 1 1/2d red-brown (SG 64) tied to piece by full A09 duplex with NEVIS cds alongside dated 25.MR.31. ST.KITTS - 1938 1 1/2d cover to UK cancelled SANDY POINT. 1938 (AU.9.) cover addressed to UK (central fold) bearing GV 1 1/2d adhesive (SG 40a) tied by superb ST.KITTS/SANDY POINT cds with star code. 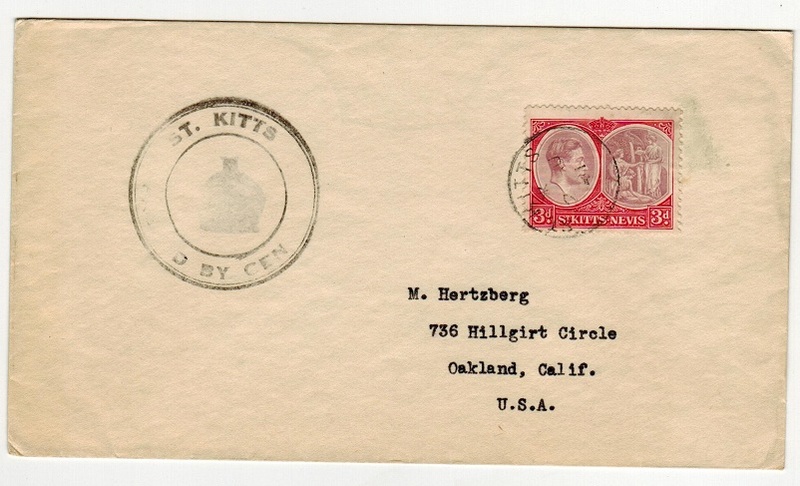 ST.KITTS - 1923 use of scarce 2d TERCENTENARY adhesive on OHMS envelope to USA. 1923 use of manilla O.H.M.S. 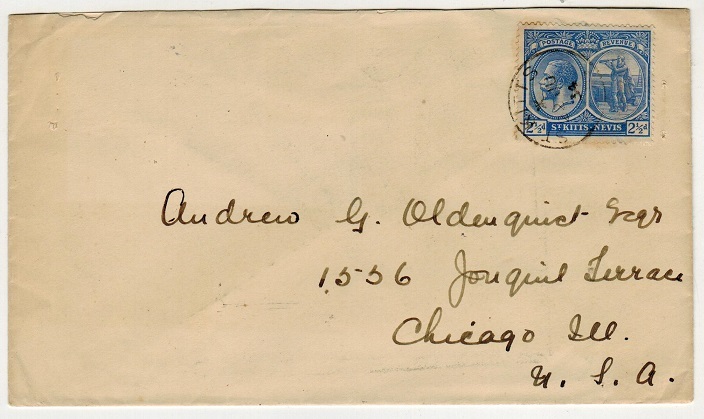 envelope (135x105mm) addressed to USA bearing the 1923 Tercentenary 2d (SG51) tied by 'A12' duplex with ST.KITTS cds alongside dated OC.5.23 & black two lined POSTMASTER/ST.KITTS h/s. Scarce stamp used on cover. ST.KITTS - 1891 2 1/2d PSE of Leeward islands used at ST.KITTS. H&G 2a. 1891 2 1/2d light blue on cream postal stationery envelope of Leeward Islands (type b) addressed to Switzerland & cancelled by s/r ST.KITTS cds dated AU.5.96. H&G2a.